Peach champagnepear cut sapphire gemstone in diamond halo surround and rose gold mount. 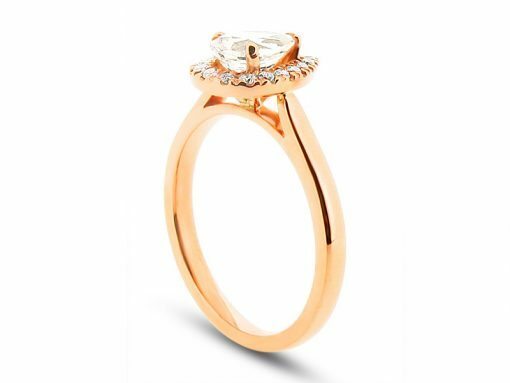 A bespoke cut peach sapphire in pear shape set into a rose gold and diamond halo setting. This is an example of a custom made ring that was designed for one of our clients. Sapphires with a champagne/peach/pink colour are growing more popular, and are ideal engagement ring centre stones due to their durability. 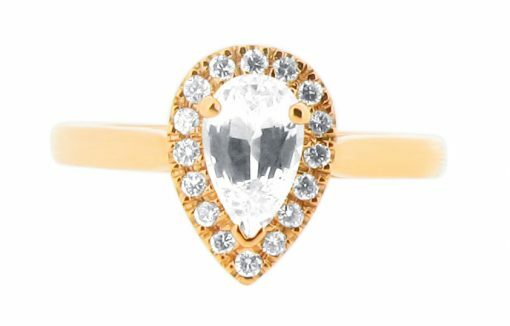 A diamond centre stone in yellow or white would also be a gorgeous combination. Visit us at our offices in Dublin and London where we have a wide range of stones available. We are happy to source your perfect gemstone and built a customised ring around it.